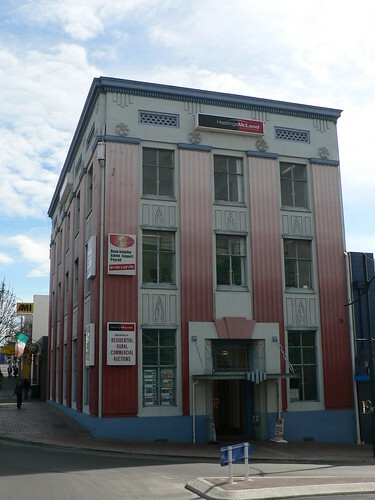 I thought this was the former State Fire and Accident Insurance Office in Christchurch but I was wrong. It is in Timaru down the coast a bit. 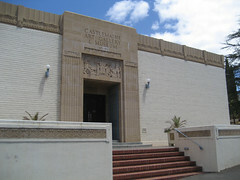 It is now used mainly by the Real Estate company Hastings McLeod. 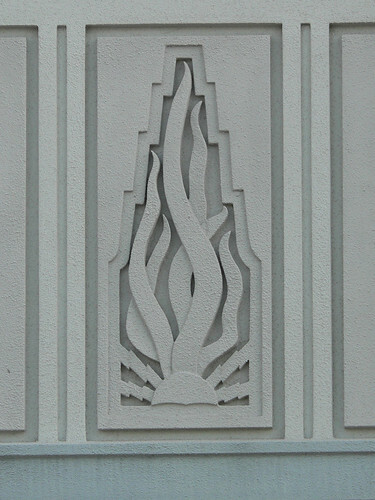 In any case, it might still be a State Fire and Accident Insurance Office since there is one major clue, this magnificent stylised flame motif that appears below each window. And the graduated red paintwork on the columns is somewhat fire-like and is perhaps a subtle reminder of the building's former use. The doorway however appears to have been changed with a porch added requiring one of the flames to be covered but the complex deco patterns (perhaps Maori inspired) on either side of the transom window are still visible. 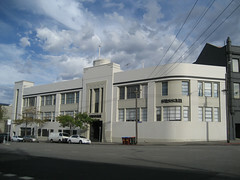 There are many aspects of the Sussan Building in West Melbourne. Firstly, the building has been designed to make the best use of the site especially the way it curves to follow the obtuse angle of the adjoining street. Also as the main street runs downhill, the lower floor expands leaving the roofline at a constant level. The main entrance is marked by a square parapet with a circular demi-tower. There is also a squat flagpole with a double finial on top. At the far end of the building in a square tower containing a stairwell and my favourite piece of decoration. 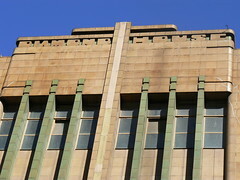 The space above the narrow doorway at the base of the tower is dominated by this wonderful piece of deco masonry. I been having some fun over the last few days on a site I've just discovered called Red Bubble. It is a site where artists can present their work to a global audience and potentially sell them in various formats including greetings cards, laminated prints and framed prints. 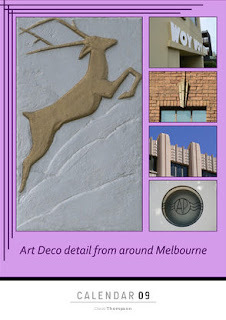 I created a calendar featuring some of the Art Deco architectural details from around Melbourne. Click on the cover above or the link below if you want to have a look at the photos I selected for the calendar or maybe even buy it !!! Dating from 1936, by HW & FB Tompkins. Sitting opposite Myers in Bourke Street Mall, the name across the rooline says it all. 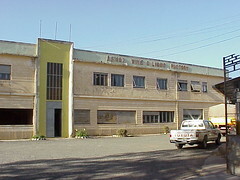 Looking at this picture of the Asmara Wine & Liquor Factory reminds me so much of this city once you are away from the main streets of Liberation and Martyr's Avenues. The wide, almost dusty, streets are all but deserted, certainly there are very few cars. And more often than not the most memorable colour is the purple of the bougainvillea. The building itself is a long horizontal mass arranged asymetrically around the entrance. Two rows of irregularly spaced windows which perhaps have been altered over time. As can be seen in the second picture, it seems unusual to me for the windows of the separate floors to be so different. I like the light green band along the roofline bearing the incomplete name of the factory and the scale of the yellow rectangular element around the doorway and the 15 panes of glass above it. It looks like the arrangement of glass and the doors occupy the same area on the facade making the haphazardness of the other windows more puzzling. 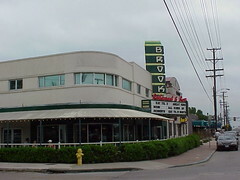 The Brook Theatre in Tulsa was designed by William Henry Cameron Calderwood in 1945. It is now the Brook Restaurant and Bar and it is nice to see that the vertical fin displaying the Brook name has been retained. The marquee on the front has also been retained and is now used to display selected items from the menu. 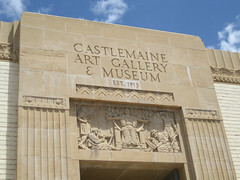 The Castlemane Art Gallery & Historical Museum occupies this art deco building. 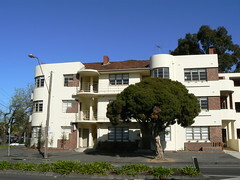 Dating from 1931, it was designed by Percy Meldrum. At first, the eye is drawn to the carving and incised name above the door but then you start to notice other things. 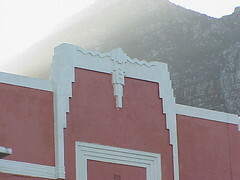 There is a deep decorative border along the facade of the building at the roofline and the horizontal row set in a raised border on the retaining wall at the front of the property. There are also two square planters placed either side of the entrance. But in the end, the eye returns to this incredible carving. 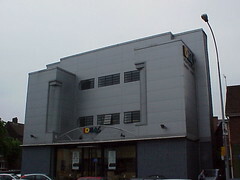 The Majestic Cinema in Belfast opened in May 1936 and closed in October 1975. 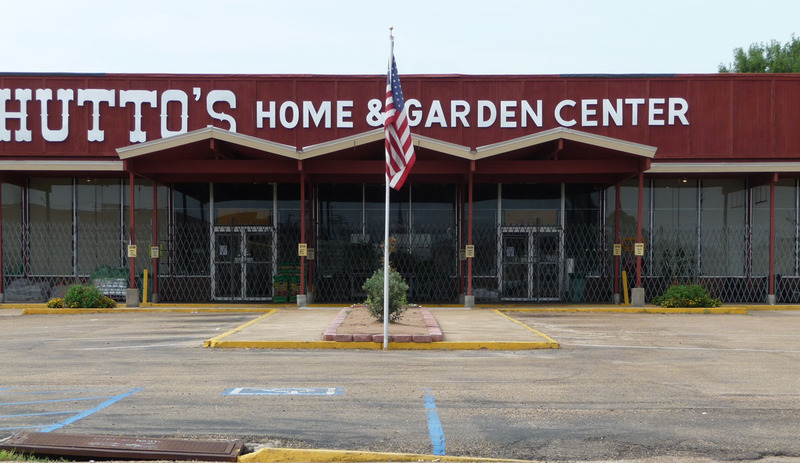 It is currently an Ideas furniture store. 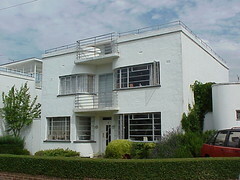 It was designed by Belfast architect J McBride Neill. 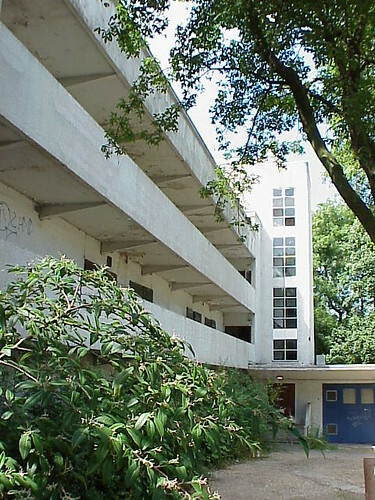 The basic shape of the building remains but the original tiles have been removed or covered. Certainly the flagpole which was at the centre of the facade has been removed. There is a great picture of the cinema in November 1954 on Flickr (www.flickr.com/photos/oldcinemaphotos/2298609350/). 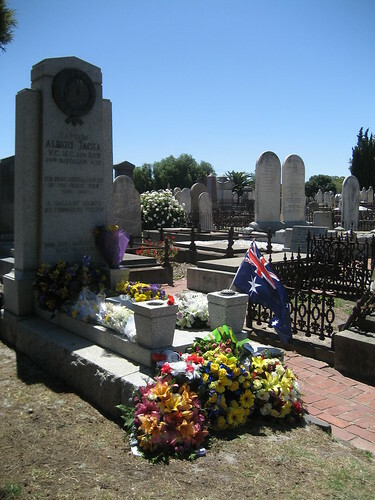 On Sunday I attended the Albert Jacka Memorial Service at St Kilda Cemetery. 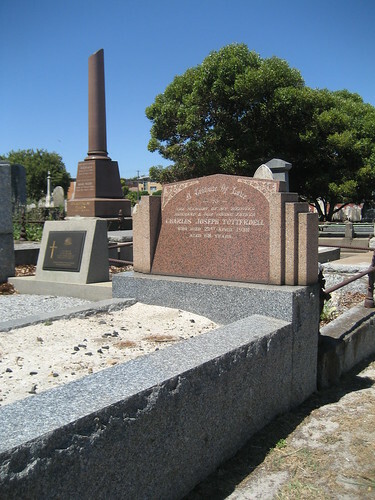 Captain Albert Jacka VC MC and bar served in the 14 Battalion, AIF during WWI. 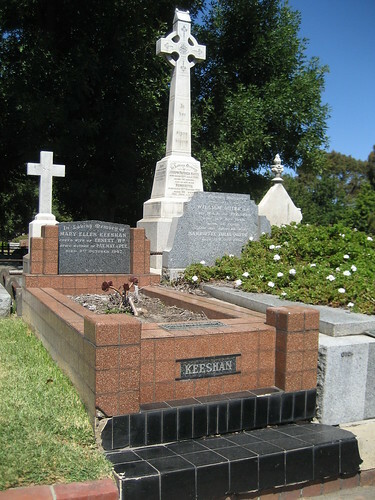 He was the first Australian to be awarded a Victoria Cross and probably should have received one or two more for later acts of bravery during the war. 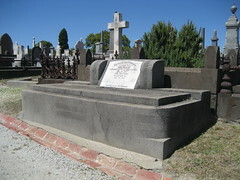 In 1929 he was elected to St Kilda council and served as the Mayor in 1930. While on Council, Jacka, worked to assist the unemployed of the area but did not seek re-election when his term ended in 1931. 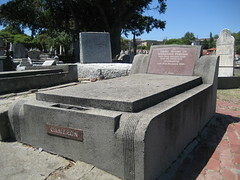 In December of that year he was admitted to the Caulfield Military Hospital and died on January 17, 1932 aged 39. 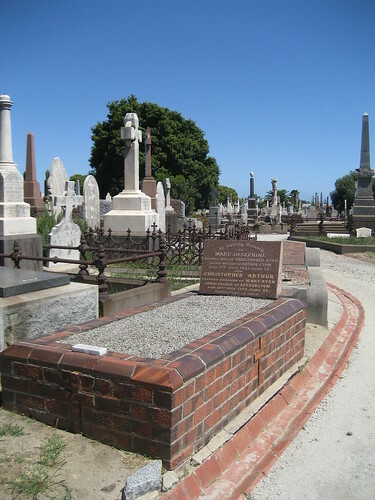 He was a true hero and Jacka Boulevard on St Kilda's beachfront is named in his honour. 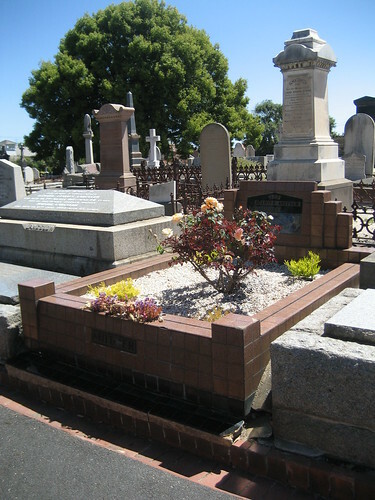 While visiting the cemetery I took to opportunity to hunt out some art deco grave sites and it was interesting to see the different styles and materials used. 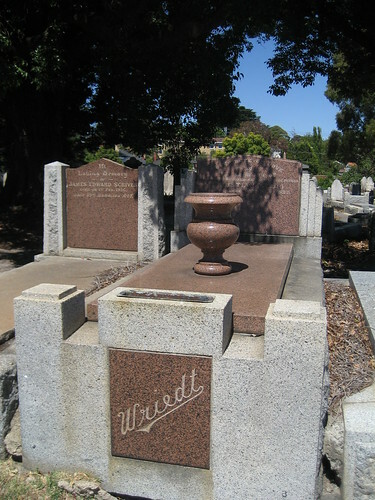 There are many simple concrete graves with curved ends decorated with simple parallel lines etched into the raw surface. 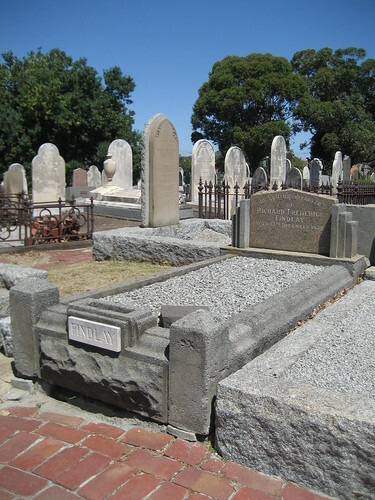 Others have stepped supports for the headstone. This one used decorative bricks. 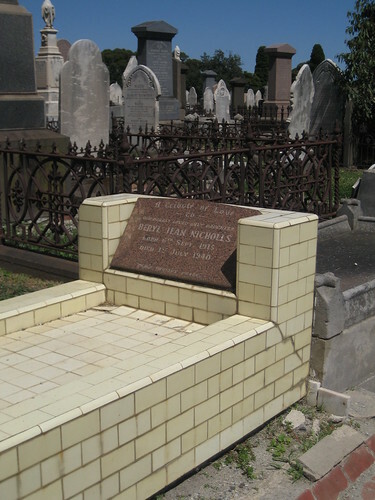 These graves used glazed brown tiles. 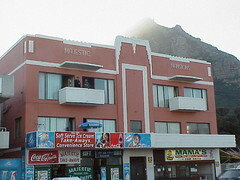 During the Cape Town World Congress on Art Deco in 2003 we were taken all over the city and nearby suburbs without any real idea (as visitors) exactly where we were. Sometimes we are a bit like sheep and, perhaps not blindly, but certainly hurriedly, we snap pics of some great buildings as we glide past. Majestic Mansions falls into this category because I don't know exactly where it is and frankly the pictures are not that good. But the building is a little ripper. I especially lke the concrete balconies with the small shade eyebrows above them. The building also has some nice decoration in the raised section at the centre of the roofline. Check out Randy Juster's photo of Majestic Mansions if you want to see the buildng in it's best light. The thing that first impressed me about the former Wimmera Stock Bazaar in Horsham is the bulk of this single storey building. The tapering towers are reminiscent of the pylons of the ceremonial gateway on a ancient Egyptian temple but with 20th Century design elements such as the recessed rectangular panels bisected by a substanial vertical bar. The former bazaar dates from 1936 and was designed by L H Vernon. 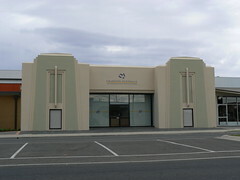 It was listed by Heritage Victoria in 2002. I'm not sure if the windows in the base of the pylons are original features but I don't think they detract from the building at all and if they allow it to be re-used as office space then so much the better. 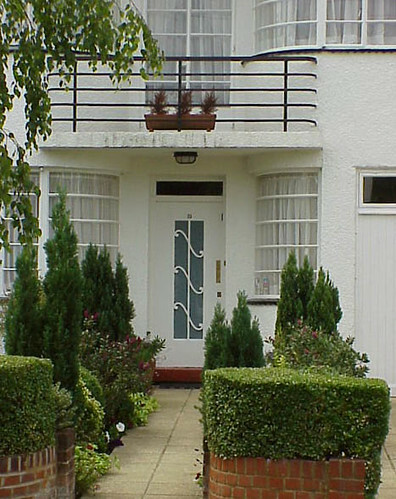 Tucked away in Hampstead Garden Suburb, in north London, is a wonderful little cul-de-sac of white modernist houses. 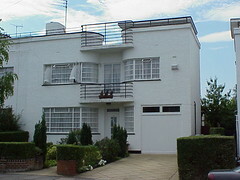 They date from the mid 1930s are protected with a Grade II heritage listing and at least some of them were designed by architect G G Winbourne. The design of each house is different but the all have a flat roof offering great views over the surrounding streets. Several have a glass room on their roof. The metal-framed windows are another common feature as can be seen in the above photos. The houses also have a central bay and the walls (and windows) curve into the recessed opening. These bays have a small balcony on the second floor and also at roof level, both with metal railings. Some of the houses also had (very) small garages and this one (below) has a very stylish front door. I've found a couple of Lytton Close houses listed for sale on the net and they will only set you back between £1,275,000 and £1,650,000. 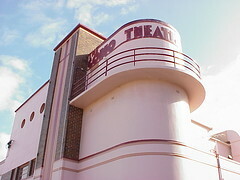 The Como Theatre in South Perth opened in 1938 and was renamed the Cygnet in the 1960s. 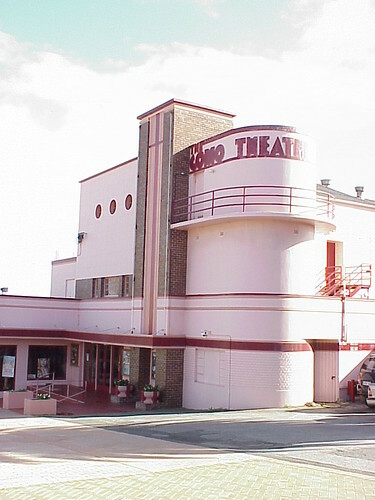 The theatre is located on a sloping site with magnificent curved 'prow' with the old Como Theatre name in relief on the top and a walkway with a metal railing. 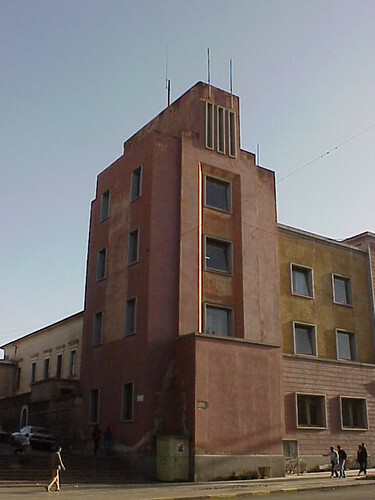 The rest of the building is constructed from rectangualar shapes separated started with a square brick tower decorated with vertical lines in multiple shades of reds and pinks. The large rendered wall next to the tower features 3 porthole windows high on the pink expanse. Park Gate apartments sit on the corner of Cecil St and Albert Rd, South Melbourne overlooking Albert Park Reserve. 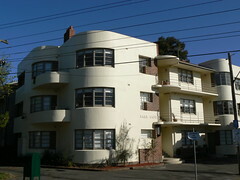 The block was designed by architect I G Anderson around the mid 1930s. The photo on the right shows the view from Albert Rd, with the curved stepped back facade and small private balconies. Along Cecil St, the building is more rectangular with communal walkways providing access to the apartments on the upper floors, their metal balustrades reminiscent of the railings on a ship. This facade does also have curves in the private balconies at the rear of the building and the curved rooms and windows of the apartments themselves. There are also the curved landings on the main staircase toward the front of the building. The lower level of the stairs is finished in terazzo where the upper storeys employ plain concrete. At the foot of the stairs there is a fabulous wall light and the name "Park Gate" in relief higher on the wall. It is nice to see that the lettering has been painted in the last few months (between my photos) but the tree has grown very quickly and is already starting to block the name. From this angle you get a good view of the unusual window treatment where reversed 'L' tetris block of bricks take up the bottom right portion of the opening. At ground level, behind the new tree, the brickwork is extended to additional 'step' to the pattern while the window has been simplified as a small rectangle. 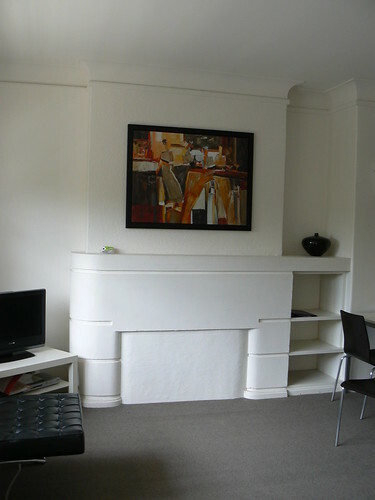 The apartments have been refurbished but the fireplaces have been retained. There appears to be a few standard layouts with a couple of different but similar style fireplaces. 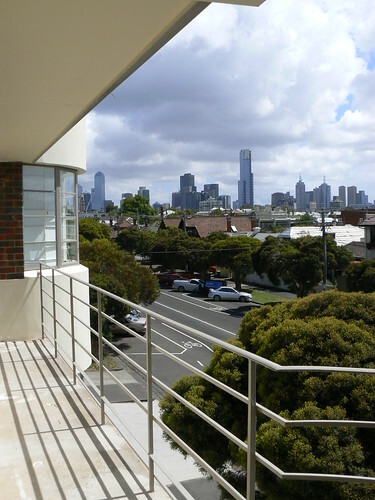 The upper storey offers a great view of the park to the South and the city of Melbourne to the North. 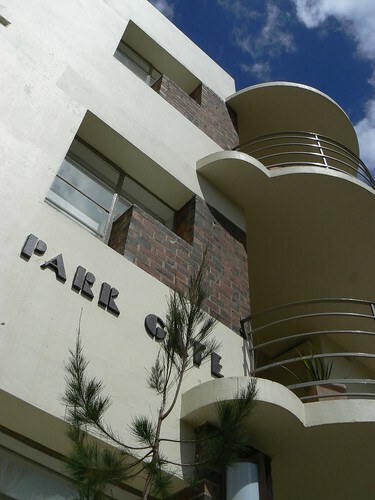 Park Gate is currently run as Serviced Apartments which can be leased by the day, week or month. I can think of worst places to stay. 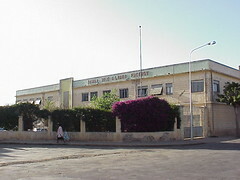 As one of Benito Mussolini's pet projects it was natural that Asmara would have an example of Facist architecture and perhaps not surprisinging that it was the Casa del Fascio or Facist Party Headquarters that would be that building. This monumental, yet austere, building was designed in 1940 by Bruno Scalfani. It built on an earlier Casa del Fascio which operated as a Social Club for party members. That building was set back from the street and was accessed via two flights of stairs directly off the footpath. This allowed Scalfani, whose building was sited at street level, to incorporate the assembly hall at the heart of his structure on the second storey. The asymetrical facade is dominated at one end by this tower topped by an arrangement of three narrow vertical windows. 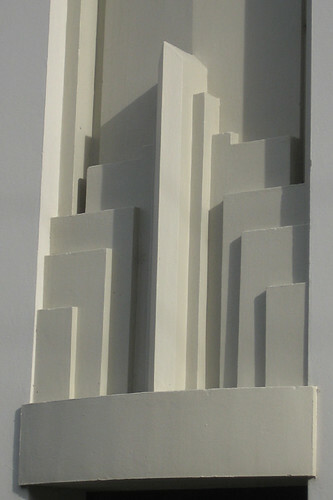 The original plans, reproduced in Asmara - Africa's Secret Modernist City by Edward Denison, Guang Yu Ren and Naigzy Gebremedhin, show four of these narrow windows at the top of the tower. Inside the foyer, two staircases lead to the main rooms on the second floor. 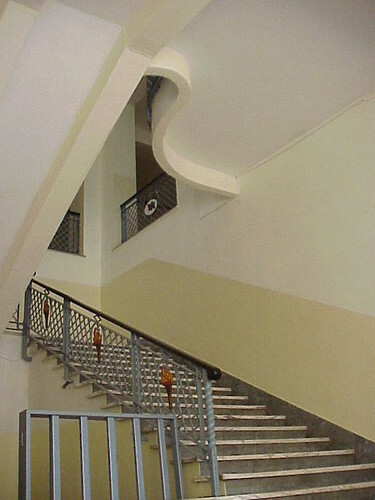 The rounded balconies on the upper floor provide elegant curves to the ceiling above the stairs. Again on the upper level, the metal work of the balconies incoporate Eritrean flags which must have been added since liberation in 1991. I wonder what was originally intended for these spaces as the Italians themselves were evicted from Eritrea in 1941 by the British and probably the building was not completed by then. 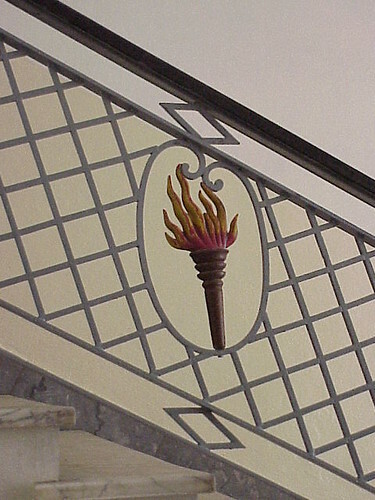 The metalwork on the bannisters leading up the stairs incorporate these magnificent flame torches. These may or may not have been part of the original design. 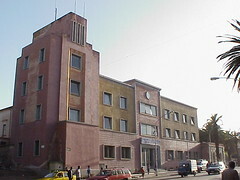 Today, the building is used by the Ministry of Education. 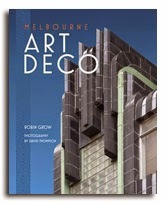 Recently, ES Developed, a graphic design company from Florida, wrote about Art Deco as inspiration on their blog. Specifically they wrote about Agatha Christie's Poirot and used one of my pictures of Florin Court, the building used for Poirot's residence in the British TV series, to illustrate their point. It got me thinking about Lawn Road Flats in north London where Agatha Christie was a famed resident as was Bauhaus architect Walter Gropius. 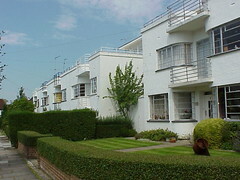 Lawn Road Flats were designed by Wells Coates, evolving from a project to design two houses for Jack & Molly Pritchard. 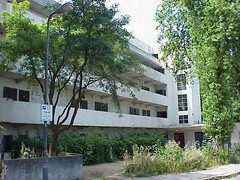 As the plans developed the building became an experiment in modern communal living. The accommodation was simple but comfortable with furniture from the Pritchard's company Isokon. On the ground floor there was a shared dining facilities. I visited during the London Open House weekend around 2000 and the flats were not in a very good condition at all. As you can see from the photos, the garden beds were overgrown and full of weeds. There was even some graffiti but surprisingly not that much considering the 'blank canvas' it presented. It was very interesting to see inside some of the flats despite their condition. They are very small even by London standards. The good news is that the flats have been restored since then. From the photo on the Twentieth Century Society casework report they look fantastic, complete with Isokon furniture. 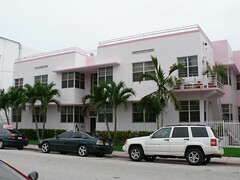 A great apartment block in Miami South Beach. I especially like the window that cut into the corner of the recessed central section of the building and thin concrete eyebrow that sits above the second storey windows. 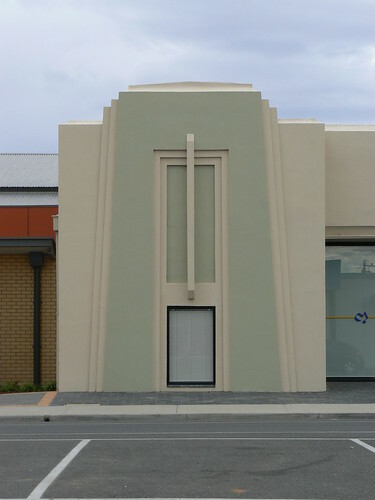 There also a similar eyebrow over the windows on the ground floor. I looks like the building has a flat roof with the railing around the front section. 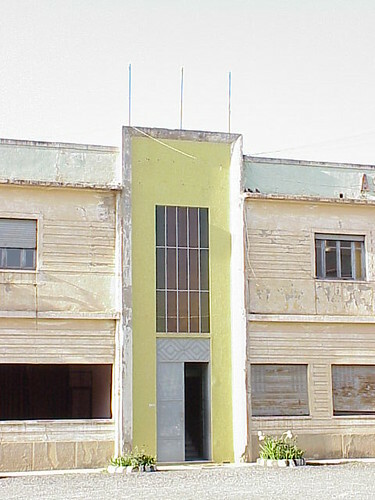 Above the central recessed section of the building, there is a panel with three raised vertical lines. Above that there are two arrangements of three discs incorporated into the metalwork of the roof top railings. 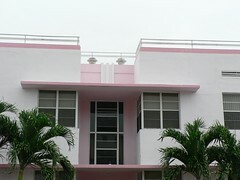 The pinks of the building certainly convey the Miami Deco style. 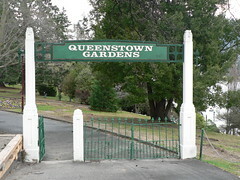 Queenstown Gardens sit on a peninsula jutting into Lake Wakatipu overlooking the city of Queenstown itself. The gardens were gifted to the public in 1866 by local businessman Bendix Hallenstein. This entrance certainly has a deco look to me. The sign is stepped along the top and the posts are stepped on top as well. The squares on the sign and the decorative elements on the outside of the posts perhaps point to a slightly earlier period but I haven't found a date to confirm it one way or the other. 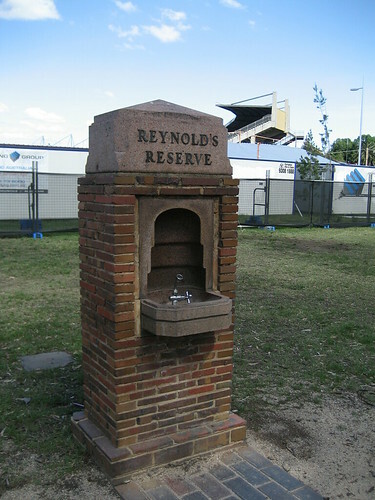 Yesterday I wrote about a drinking fountain in Hardy Reserve, Carlton. Today I've got another drinking fountain in Carlton but with a different design. 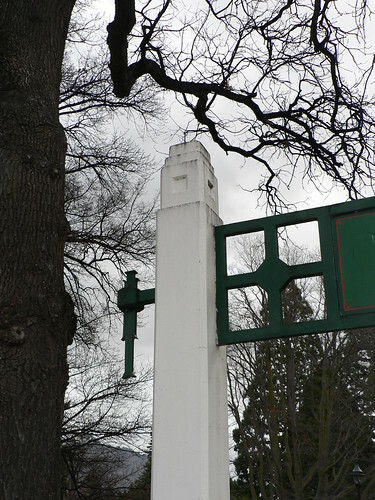 This one is on the other side of Princes Park near Royal Parade. 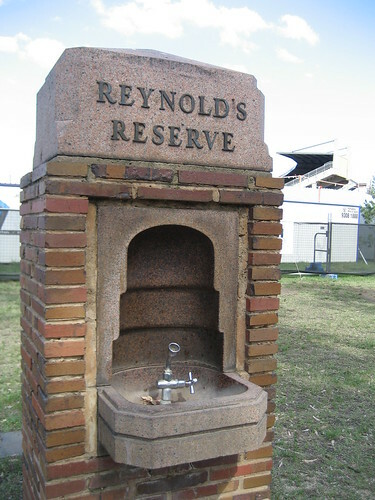 It is constructed from thin red brick with a, perhaps, granite top inscribed with the legend "Reynold's Reserve". The cavity for the fountain is a beautiful stepped semi-dome. I couldn't see any details of who Reynolds was and why the reserve was named in their honour.